Above Studio is an artisanal accessories brand that presents traditional handcrafted collections made in Thailand by local artisans. To cherish the art of local craftsmanship and pass it on to next generations to come, Above Studio's key commitment is to use only local resources available in Thailand. Through beautiful handwoven accessories, Above Studio shares the beauty of Thai culture, local natural materials, the skills of the makers and the heritage of the land with the rest of the world. Above Studio is also focused on its bold social mission: the profits from each product sold will contribute aid for local communities, and help to sustain and empower them. 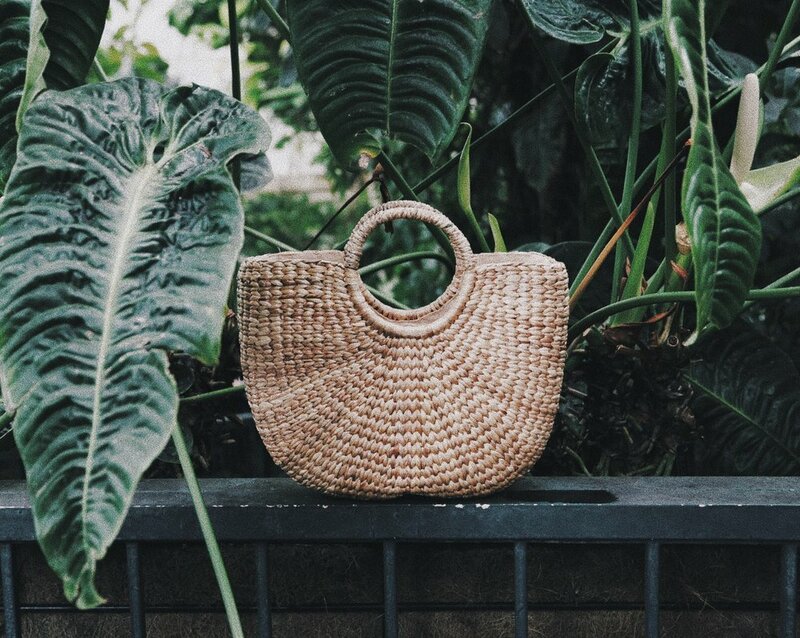 We spoke to Above 's founder, Sommy, about their first curated collection of woven baskets, and the importance of preserving the heritage of traditional craftsmanship today. ABOVE Studio woven accessories brand has just freshly launched. Tell us a little bit about the journey: what led to launching a beautiful sustainable accessories brand this spring? I am a former associate fashion designer from NYC. After I took a wonderful trip back to my hometown in the Northern part of Thailand during Christmas 2017, I found the hidden beauty of handcrafted products from local villagers. They have extraordinary weaving skills, and their woven baskets are so durable and neat. I then came up with an idea of designing products that I like, and making orders to them. Your professional background roots back to working in the traditional fashion industry. Was there a personal enlightenment involved linked to the environmental impact of the fashion industry today that gave grounds to creating ABOVE Studio? I grew up surrounded by nature. My dad’s family has a corn field and my mum's family also grows fruit for selling in a province near Bangkok. Every semester break, I headed there to visit both families. My parents always told me to take care of this world and the people around me. They also taught me how valuable our nature and environment are. If everyone realised that, we could collectively improve our society and the planet's future. You are focusing on traditional handcrafted collections by local artisans in Thailand. What most allures you about the local craftsmanship, and what is the exact heritage being passed on to the wearer of ABOVE Studio items? I was born in Thailand and I have seen its unique, absolutely beautiful culture and traditions for almost all my life. I have always been keen to present these beautiful handcrafted items to the world, and I always wanted to contribute my part, for people to experience the unique culture of my home country. This is especially true for the weaving skills and farming skills, of which the people of Thailand acquired authentic knowledge from their ancestors. "This is a way of recycling, as those unwanted plants become accessories and, at the same time, they can help the villagers to make a living." How does ABOVE Studio help to empower the local communities? What would you consider your exact social mission incorporated into your brand's very DNA? Every product sold will contribute back to local communities and aid whatever local people need. For example, clean water and school supplies, in order to help community grow stronger and better. This will create a real basis for a sustainable community. What are the exact raw, authentic materials you currently work with? Tell us more about the making process - how much work and effort goes into making each bag? Most of the products are made from Water Hyacinth. In Thailand, it is lodged in a wooden jetty in the Chao Praya River. Water hyacinth is a weed that clogs waterways. This is a way of recycling, as those unwanted plants become accessories and, at the same time, they can help the villagers to make a living. Moreover, I plan to expand the products to home decor, and I try to use natural and handmade textiles from another village. "Thai people always keep smiling, no matter what happens. That’s why they called my country 'a land of smile'." How does the local Thai culture and the natural surroundings inspire you in your everyday? Would you consider yourself a slow living advocate in that respect? I like smiling and people around me said that I radiate a lot of positive energy. I truly consider myself a slow living advocate, especially, when living in NYC where everyone is extremely competitive and constantly in a rush. Whereas, I just want to go to my favourite yoga studio and have a meditation session at the end of the class. However, when I keep going back to my homeland, Thailand, I find that everyone just keeps smiling to each other. Then I realised this may be something unique and symbolic to my own culture, local Thai culture. Thai people always keep smiling, no matter what happens. That’s why they called my country 'a land of smile'. Would you say we have lost our respect for artisanal craftsmanship in today's speed culture? What's your opinion, why should traditional craftsmanship make a comeback? “When I buy something, I will not buy it just for selling it later”, that always comes to me as the first thought. If I want to express my personal taste, I would definitely buy something that is unique and rare, and that would not look like anyone else's. The same principle applies to ABOVE's products: every piece is different and unique, and created with the aim to show how I value handmade and handcrafted products. In the modern society, I feel like sometimes people lose their own personal identity, because they just keep following the trend. On the other hand, I really want to be who I am and only respect my own taste and style, and that's why I value artisanal craftsmanship. The world would be the better place if we all valued handcrafts. Enlighten us more about the story of the makers - who are these Thai craftswomen working for you? How do they earn their living? Those works are priceless and they are made of natural material from villagers. I try to gather and connect local Thai suppliers who have traditional wisdom in Thailand. There are many villagers in Thailand, and most of the Thai craftswomen I work with are farmers, since our country is an agricultural country. In the farmer's season, there is a job to do. But after harvesting, farmers don’t have a job. So, these handcrafts would help them have a job. Also, making handcrafted products is a complex process, as it takes more than a couple months to prepare the material for weaving. Dedication and passion of the craftswomen is what makes this work special and unique. "When you have faith in your passion, keep pursuing it and keep fighting for it, and you will succeed one way or another." Equating fashionable aesthetics with a larger environmental benevolence - not an easy path for anyone to push forward. What keeps you motivated daily and keeps you going in your current chosen career path? When I worked in high fashion, I found myself getting a bit lost sometimes in between all those expensive things I saw every day at work. However, when I turned my back on high fashion, and continued working with sustainable fashion and crafts, suddenly, all my passions - nature, design and fashion - became tightly linked together. I feel like I am living a dream now. I feel like I have more motivation to work every day. When you have faith in your passion, keep pursuing it and keep fighting for it, and you will succeed one way or another. What is the one message you'd like to send out about your journey of artisanal craftsmanship and the future of the industry? Why is it important to keep supporting local makers? You have to find yourself first. It’s okay to be a bit lost at the beginning and it’s okay to step back a little bit to move forward after, but we all have to keep going. I just had to realise that it's an entirely different work experience from high fashion, and that it's also a learning curve. But the experience allows you to make a better version out of yourself for the future. Lastly, nowadays it’s difficult to preserve and protect local cultures, as it's 2018, and we are living in the technology world. Supporting local makers would be the best way to preserve these cultures for our next generations to come. By what it feels like, more and more brands globally are encoding a degree of mindfulness into their operating policies. Collectively, we are working for a fairer fashion industry. What makes ABOVE Studio stand out? Recently, a lot of global brands have paid more attention to their operating policies, since people are demanding it. We believe that we could get a better quality out of the fashion world, to make it fairer. For ABOVE Studio and the ABOVE brand, we work and interact closely with our local artisans and even contribute a part of our profits to innovative projects, like improving human capital and the skills they need for making the handmade products. We believe that our products are 100% quality oriented, and 100% made with love by our local artisans. How can we make something that affects us all on a global scale (e.g. the imminent need to protect the environment, scarce resources) reach its meaning to the end consumer? Could it somehow be a question of personalising, creating a story that delivers around a product? Global resources are dwindling, and environmental problems are mounting, making innovation an ever-present challenge. If we are altogether conscious consumers, while remaining considerate about our environment, we will make a better version out of this world society.